Unfortunately this week got away from me. 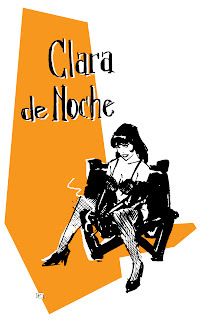 Clara de Noche piece, but I ran out of time. Instead I gussied up my sketch with a little photoshop. Once I get the finished version done i'll post it as well. You know dude, I really dig this actually. I kinda dig it more that it's a little rough then I would all polished off. A real charm to it that way. I love how raw it is. To me, it just feels more pulp! And I love the orange element... just really nice! Great sketch and stylish design--winner! I really like this one, Andy. Kind of reminds me of Jim Holdaway, and that's perfect. If this was a novel cover in a bookstore, I would definitely pick this up. It evokes such a great aesthetic.